The holidays are upon us and the scramble to get ready for Christmas has officially begun. There’s so much to do but preparing for Christmas is about getting ready for the birth of Jesus. No one prepared for that moment more in union with God than the Blessed Mother did. So what better way to spend advent than to mediate with Mary? Think of her journey leading to Christmas: The Annunciation, helping her cousin Elizabeth, Joseph’s plan to divorce her, the journey on a donkey into Bethlehem, a search for a place to stay, and then giving birth to our Savior in a manger, Mary walked humbly in faith amid all the stress. And we think the holidays are stressful? Mary’s exclusive relationship with her perfect Son, both God and man, is something not of this world. As our spiritual Mother, we have access to her and she wants nothing more than to bring us closer to her son Jesus. It only makes sense that we would turn to her for help making our Advent holy. That alone will relieve some of our stress—the stress of feeling like we are spinning our wheels and not basking in the true meaning of the holiday. Here are some suggestions on how to walk with Mary this Advent. Watch the movie Mary of Nazareth. It’s the life of Christ as seen through the eyes of his holy mother. Seeing Jesus through her eyes is a glimpse into her love and own passion. How often do we think of Mary’s suffering? Her challenges began from the very start once she began carrying Jesus. Pray the rosary daily during Advent. When the Blessed Mother appeared at Fatima and Lourdes, she asked for us to pray the rosary every day. What better time to begin—during Advent. 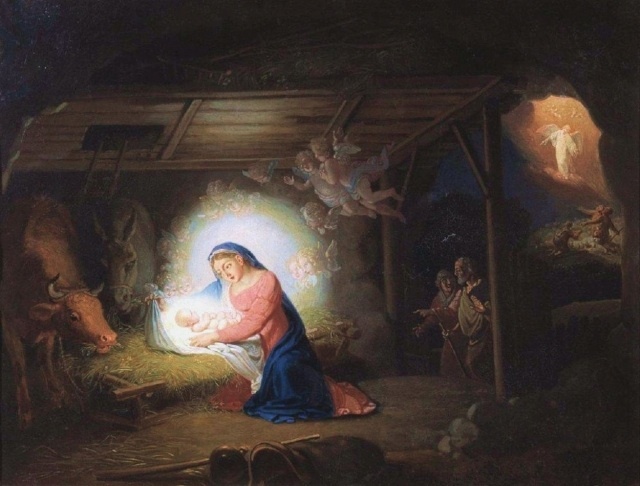 The Joyful Mysteries are especially relevant during this time. Spend time with the New Testament with special attention to Mary’s role in salvation history. See twenty verses in which Mary is mentioned here, such as in Luke 1:28: “Gabriel appeared to her and said, “Greetings, favored woman! The Lord is with you!” Once you get to those Bible verses, read the chapters around it to meditate on the life of Mary which is always a meditation on Christ also. Get a copy of Rejoice! Advent Meditations with Mary by Father Mark Toups. This interactive prayer journal that lets you walk closely beside Mary during the first Advent as you get to know her. It is filled with insights and about Mary’s life for an encounter with Mary in the quiet of your heart. Each day, aids to help guide your prayer and meditation including a daily Psalm to pray, just as Mary herself would have prayed. The nice thing about this is that it is guided and takes you day by day into a deeper relationship with Mary so help you find peace and holiness during Advent. When holiday stress gets to you, stop and reflect on the Christmas joys of Mary and ask her to fill you with that same joy. Mediate on these moments and read about them in the Bible: The Annunciation, the Visitation, the Nativity of Our Lord, and the Adoration of the Magi. Our Blessed Mother is at the center of God’s plan so we when we meditate on her life we meditate on the life of Christ in her company. Mary is the one chosen from all eternity to bring God’s Son into the world, and she is the perfect one to help us prepare for his birth.